CLEVELAND (AP) — Nothing splashy, just sensible. The Cleveland Indians stabilized their shaky outfield without making a blockbuster trade. Riddled by injuries to outfielders all season, Cleveland acquired center fielder Leonys Martin from the Detroit Tigers before Tuesday’s deadline for 21-year-old infield prospect Willi Castro. The AL Central-leading Indians also received right-hander Kyle Dowdy. Although they had been linked to talks involving more high-profile outfielders like superstar Bryce Harper, Adam Jones and others, the Indians opted to make a deal that wouldn’t be too damaging to their future. Manager Terry Francona had high praise for his front office. The 30-year-old Martin is a steady hitter and strong fielder who will take away runs for Cleveland’s pitching staff. He leads the league with nine assists. He also gives Francona another option in center field with Bradley Zimmer done for the season following shoulder surgery and Tyler Naquin on the disabled list with a hip injury. The Indians made a second move before the deadline, acquiring outfielder Oscar Mercado from St. Louis for outfielders Conner Capel and Jhon Torres. Because of injuries, Cleveland was down to Greg Allen and 37-year-old Rajai Davis as their center fielders. Also, right fielder Lonnie Chisenhall is out with a nagging calf injury. Martin has twice been on the disabled list this season with a left hamstring injury, but Antonetti is confident he’s healthy and ready to help the Indians immediately. The trade for Martin followed Cleveland fixing its worrisome bullpen. On July 19, the club sent top prospect Francisco Mejia, a switch-hitting catcher/outfielder, to the San Diego Padres for All-Star closer Brad Hand and sidearmer Adam Cimber. That major move may have impacted the Indians’ willingness to get into a bidding war for Harper, who remains with Washington. Martin batted .251 with nine homers and 29 RBIs in 336 plate appearances this season for the Tigers, who were 18 1/2 games behind Cleveland at the deadline. Martin has scored 78 runs in his first season with Detroit. The Cuba native has a .248 average with 47 homers and 205 RBIs in 699 games with Texas, Seattle, the Chicago Cubs and the Tigers. 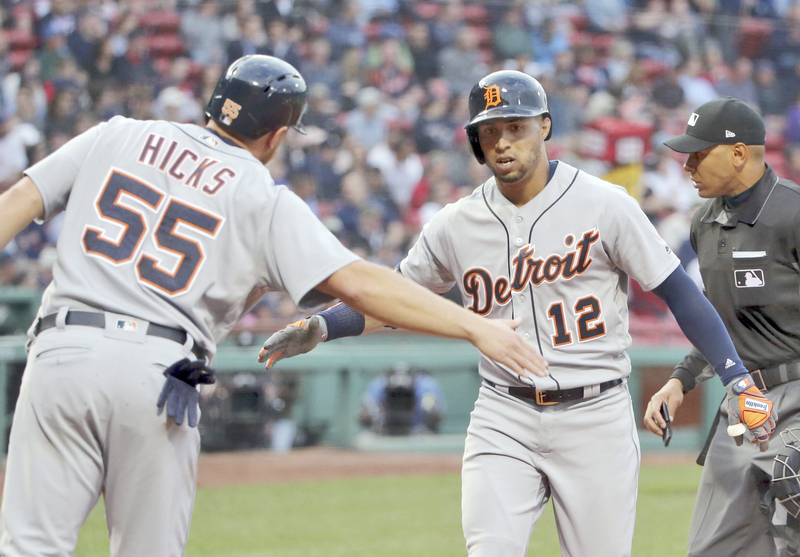 The Tigers began rebuilding in earnest last season, when they traded J.D. Martinez, Justin Upton and Justin Verlander. Their trade candidates this year were a little less prominent, but they were able to move Martin. Martin has a $1.75 million salary, of which the Indians are responsible for $573,925. He has earned $600,000 in bonuses based on plate appearances, and would earn $100,000 each for 350 and each additional 25 through 475 plus $50,000 for 500. More importantly, he is under club control through next season through arbitration. Castro batted .245 at Double-A Akron with five homers and 39 RBIs.